Files just released by the National Archives show Margaret Thatcher took part in negotiations with the IRA during the 1981 Hunger Strikes, BBC investigative journalist Peter Taylor has said. The contacts took place through an MI6 officer and a secret back-channel to the IRA code-named Soon. Soon was Londonderry businessman Brendan Duddy. Mr Taylor said Mrs Thatcher altered by hand one statement sent to the IRA. "When I read these documents I was astonished," he said. "I think that they are revelatory and of genuine historical importance because they give lie to all sorts of assumptions that were made incorrectly about the Hunger Strikes and the relationship between the government and the IRA. "These documents spell it out large that Mrs Thatcher was involved in negotiations with the IRA." The documents contain details of eight phone calls between the MI6 officer and Mr Duddy during the weekend from 4 July to 6 July 1981. This letter represents the government's final negotiating position. Margaret Thatcher made changes to it in her own hand. Among the proposals coming from IRA prisoners was that senior republican Martin McGuinness, now Northern Ireland's deputy first minister, be allowed in to see them in the Maze. This was turned down by the government. "That was all to do with the government's insistence, Mrs Thatcher's insistence, that she did not negotiate with terrorists, she did not and would not negotiate with the IRA. "The documents clearly indicate that that was nonsense, that was going on all the time behind the scene." In the final call from Mr Duddy on Monday 6 July, he said the IRA endorsed their earlier demands and wanted to see a government response before it was made public. The government sent a statement straight away. "This letter represents the government's final negotiating position," Mr Taylor said. 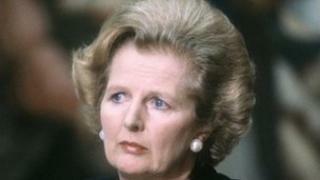 "Margaret Thatcher made changes to it in her own hand. "The issue of clothing is resolved, the issues of parcels and visits is resolved, but again, critically, the issues of work and association are not resolved. "It's Mrs Thatcher who crosses out the relevant parts of the document that indicate she, the British government, is not prepared to give in on work and association." At the end of the statement was a message. It read: "If we receive a satisfactory response to this proposal by 9am on Tuesday 7 July we shall be prepared to provide you with an advance text of the full statement. "If the reply is unsatisfactory and there is subsequently any public reference to this exchange we will deny it took place." Mrs Thatcher's former chief press secretary Sir Bernard Ingham said he was completely unaware of any negotiations involving the prime minister. "As far as I can see, there wasn't a great deal of negotiation here," he said of the newly released documents. Sinn Fein's former director of publicity Danny Morrison, who helped lead the negotiations, said Mrs Thatcher was not prepared to do a deal with the IRA during the Hunger Strikes. "Humphrey Atkins, who was secretary of state, and Michael Ellison, who was the prisons minister, their advice to her throughout was 'do nothing, don't move'," he said. "If we go back to a document that was released, on the 18 July this is what the document says :'She (Mrs Thatcher) was more concerned about doing the right thing by Northern Ireland than to try and satisfy international critics'."